We are located in the heart of Keystone Resort. Walk to the slope, the shops, the restaurant, and to live entertainment. Wake up to a spectacular view of the mountains and all that nature offers. Sit on the deck and watch others or relax in the condominium with your favorite movie or family board games or book. Wake up to Starbucks coffee, eat breakfast in the comfort of your condominium as the fireplace roars. Walk to the slope and enjoy the wonderful skiing day and night, and walk back to your condominium for lunch and a hot drink. 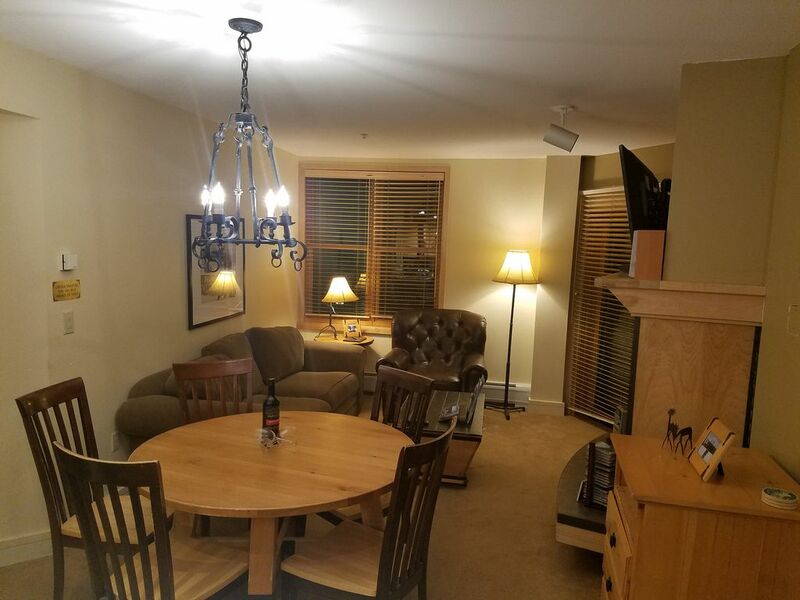 After a full day of skiing, relax and soak in one of three hot tubs or outdoor, heated pool and enjoy the stars and the moon as can only be seen in the serenity of the mountains. Walk to one of the many night clubs, play pool in the lodge, or retreat back to your condominium to prepare for another fun-filled day of activities. Keystone is a family-friendly resort and condominium life makes it affordable. A washer and dryer are located in the lodge for your convenience. Bring your favorite CD, cassette tape or DVD and enjoy a movie with the family. Once the children are snuggled in their bed, sit on the deck and enjoy the mountain view. -Keystone Resort has free bus service to all locations within the resort. -Summit Stage (pick up at Mountain House) offers free bus service to other resorts: Breckenridge, Copper Mountain, Loveland, Arapahoe Basin, as well as the towns of Frisco, Dillon, and Silverthorne with its outlet Malls! Not a skier? Go shopping! Factory Outlet Stores are located within a ten-minute drive. We hope that you visit our condominium and know that we are owners who care about the comfort of the people who rent from us. We have worked very hard to provide you with the comforts of home. See rates for date details and calendar for availability. Call or email for last minute specials ! Festival or Holiday Week Varies. We live in Denver and enjoy our condo year-round. toilet, combination tub/shower, tub, Spacious bathroom includes a double sink and blowdryer. toilet, combination tub/shower, tub, Bathroom is equipped with a blowdryer. Guests are supplied Lemongrass shampoo, conditioner, shower gel and lotion. Towels are provided. New towels may be requested for a fee. Laundry facilities are located on both 4th and 5th floors. Underground indoor heated parking is located in the basement of the building. Elevator access to condo. Our unit is conveniently located a short distance from the elevator and stairwell. Kitchen recently upgraded with granite stone counter tops, stainless steel sink and kitchen faucet. A large selection of music from a variety of genres. We have a variety of DVD movies suitable for all ages. Loved the condo and it’s location. First time skiing for my kids and they loved it. We will definitely be back. 3rd time staying at property. Very happy with all aspects. Extremely clean/organized property. Great location. Perfect for our family of 4. We value your feedback and are happy you had a positive experience. Very clean and comfortable with all amenities provided. Great location! Very convenient to catch the shuttle to go to different areas. Lots of food choices nearby. Would definitely stay here again. We have a 2 to 5 night minimum stay depending on the dates. Nightly minimums do not apply if there are less nights available between bookings. Cancellation: Cancellation outside 60 days of arrival is subject to $50.00 processing fee per reservation. Cancellation inside 60 days of arrival is subject to forfeiture of full payment. No shows, late arrivals and early departures are charged the entire amount for the reserved stay. Cancellation inside 90 days of arrival during holiday season: December 20 - January 3, is subject to forfeiture of full payment.